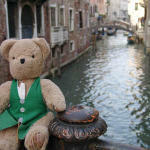 Venice is built on lots of small islands, there are not many roads so people use canals to get around. 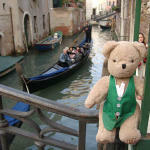 The boat about to go past Barnaby is called a Gondola, it is a special boat found only in Venice. 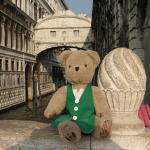 This is the Bridge of Sighs, naughty people used to cross over the bridge to go to prison a long time ago. 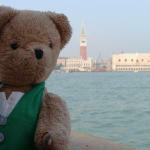 Behind Barnaby is the most famous part of Venice, St Marks Square. 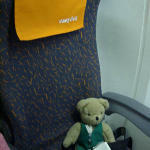 Here is Barnaby in his seat waiting for the plane to take off home. 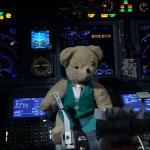 The pilot kindly let Barnaby visit the flight deck of the Boeing 737 before take off, it looks very complicated! 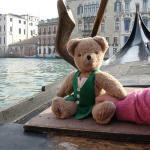 Here is Barnaby taking a ride across the Grand Canal on a gondola.